Pass your NMLS test! All of our practice mortgage test questions are carefully crafted by an expert mortgage instructor to meet or exceed the difficulty level of the actual SAFE MLO test. Don’t rely on the outdated material on other NMLS practice test sites! 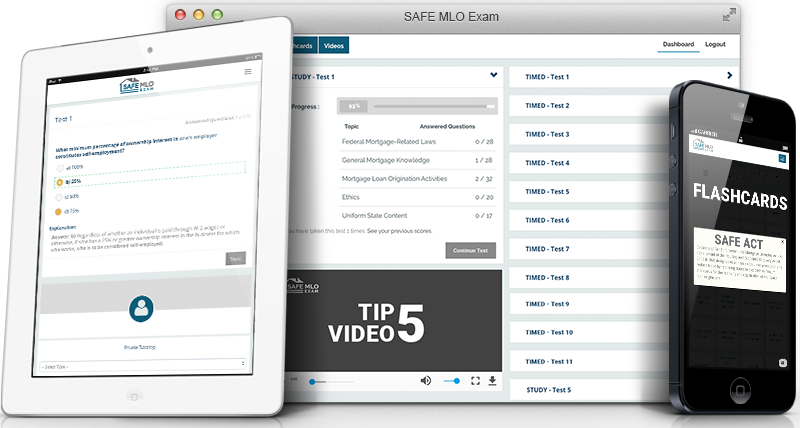 Our MLO test study guide and practice mortgage tests are up to date with the latest 2019 rules and regulations, and has helped thousands of test-takers pass their MLO exam! We are totally confident that our mortgage test prep will help you pass your mortgage loan originator exam, we offer a 100% pass money-back guarantee! Take an unlimited amount of tests! MLO Test Prep Includes: Federal Mortgage-Related Laws, General Mortgage Knowledge, Mortgage Loan Origination Activities, Ethics, and Component with Uniform State Content – all up to date with 2019 rules and regulations, Including new VA and FHFA minimum downpayment amounts, TRID, VA financing eligibility, homeowner’s insurance limits, state agencies, criminal background checks, appraisals, HELOC, HOEPA.